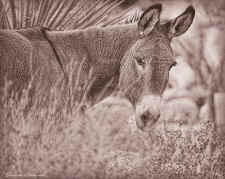 Learn more about burros here: Burrow Awareness: Celebrating the American Wild Burro. 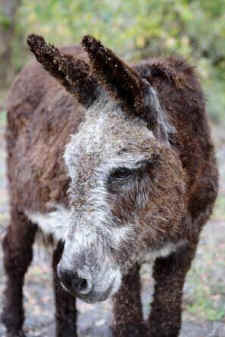 Burros are amazing, hardy animals who manage to survive under the harshest conditions. Sadly, just like their wild horse cousins, they cling to a tenuous existence in a shrinking habitat on our public lands and struggle under a management program that rounds them up and removes them from their homes on the range in the American West. During the month of May, we celebrate burros, the lesser known of the two species managed by the Bureau of Land Management (BLM). 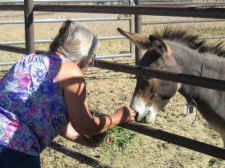 Just like wild horses, wild free-roaming burros face many hardships, including ever-shrinking habitat and a federal "management" program that rounds them up in large numbers and removes them from the range to keep burro populations artificially low. For many years Wild Girl often came here, wandering in from out of the desert that originally was Joshua Tree National Monument and later Joshua Tree National Park. 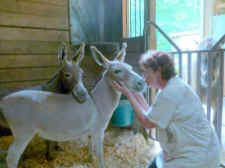 She'd come in after sunset and stay until dawn visiting with our mules and horses. No one seems to know how she wound up in the Park. There is mention of her in the book by Patty A Furbish, On Foot In Joshua Tree National Monument. My husband and I took a trip around the country four years ago and we made a stop at a few BLM holding facilities on our journey. At one of these, I spent a lot of time at the burro pen and realized how precious these creatures truly are. I visited the area of Parker Dam 2 weeks ago and happened to come across these three burros on a hike in the wash behind the dam area. It took an hour, but curiosity finally got the best of the little one and she came to within 10 feet of me. I wanted to sit down to appear less threatening, but every time I started to sit under a nearby tree they’d wheel on their hindquarters and trot away! It was only when I stood quietly and turned slightly away from them that they would approach. I slowly turned toward them and took these shots. This is my boy Zeke at an elementary school event many years ago, before his gray hairs came in! 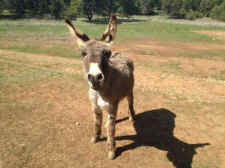 I have loved and lived with standard size burros, but currently Zeke, a 'mini', is loved and adored by all who know him! He has been to therapeutic riding barns, schools, and parades. He is lamost 20 years old with lots of years left! 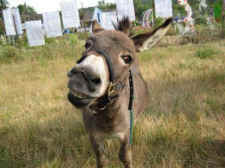 Just want to tell you what wonderful beings these burros are -- sweet natured and fun to be with. These two are jennies, Violet (dark brown) and Daisy (grey,) 2 years old and our best buddies. 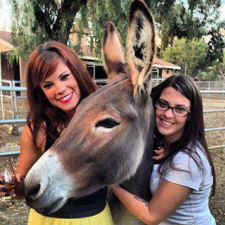 This is our BLM adopted burro Sierra, with our granddaughters Elaine and Ashley.